Did Iran's Ballistic Missile Test Violate A U.N. Resolution? : Parallels The U.S. has placed additional sanctions on Iran after its missile test on Sunday. The Trump administration says the test violated a U.N. resolution. Iran says it didn't. Who's right? 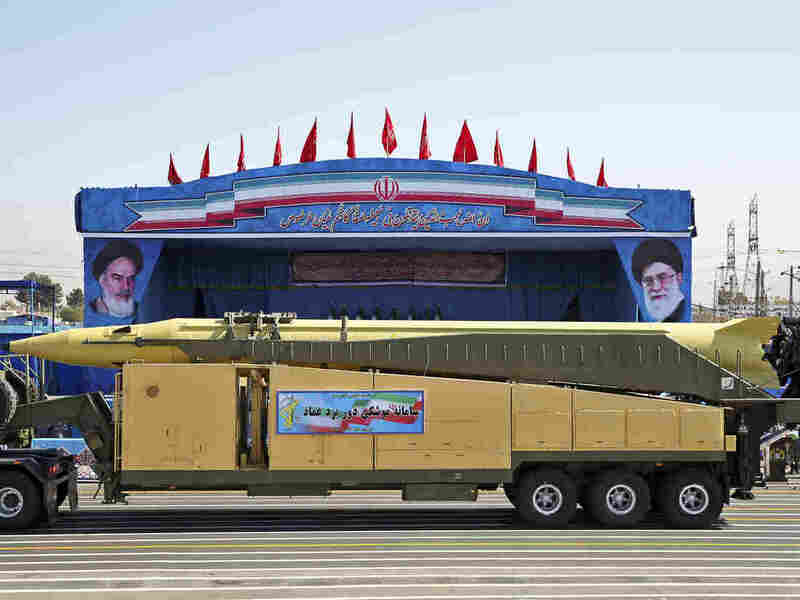 An Emad ballistic missile is displayed by the Revolutionary Guard during a September 2016 military parade in front of the shrine of Iran's revolutionary founder Ayatollah Khomeini, just outside Tehran. Iranian Foreign Minister Mohammad Javad Zarif has said Iran's missile program is not part of a 2015 landmark nuclear deal between his country and world powers. "Iran is playing with fire," President Trump tweeted Friday morning before the sanctions were announced. Trump's National Security Adviser, Lt. Gen. Mike Flynn, earlier said the missile test was "in defiance of" U.N. Security Council Resolution 2231 endorsing the Iran nuclear deal. White House Press Secretary Sean Spicer called the test an outright "violation." Iran's foreign minister, Mohammad Javad Zarif, meanwhile tweeted that Iran is "unmoved" by U.S. threats and has the right to defend itself. So did Iran violate the agreement or not? Most nonproliferation experts would say Iran certainly defied the spirit of the U.N. resolution, but technically didn't violate it — because it contains no prohibition against such testing, as one of its predecessors, passed in 2010, specifically did. U.N. Security Council Resolution 1929, from 2010, says the Security Council "decides that Iran shall not undertake any activity related to ballistic missiles capable of delivering nuclear weapons, including launches using ballistic missile technology, and that States shall take all necessary measures to prevent the transfer of technology or technical assistance to Iran related to such activities." In Resolution 2231, passed in 2015, the Security Council endorsed the nuclear deal, known formally as the Joint Comprehensive Plan of Action or JCPOA. It terminated the provisions of the 2010 resolution and added language deep in one of the annexes saying: "Iran is called upon not to undertake any activity related to ballistic missiles designed to be capable of delivering nuclear weapons, including launches using such ballistic missile technology, until the date eight years after the JCPOA Adoption Day or until the date on which the IAEA submits a report confirming the Broader Conclusion, whichever is earlier." As diplomatic terms of art, "shall not" — which appeared in the 2010 resolution — represents a clear and enforceable prohibition, whereas being "called upon" not to do something is more ambiguous. Here's one way to look at it: When Iran tested ballistic missiles in the fall of 2015, while Resolution 1929 was still in effect, it was doubtless in violation of a Security Council stricture. But when it tested its missile on Sunday, under the new Resolution 2231, Iran was essentially ignoring the Security Council's advice — not violating a directive. Conservative critics of the nuclear agreement argued strongly against the language change, calling it a dangerous watering-down of the international position on Iran's ballistic missile program. Iran has long maintained that its missile tests don't violate Security Council resolutions because there are no nuclear warheads involved and Iran's conventional defenses are its own business. But both the 2010 and 2015 resolutions do warn against testing missiles that "could be capable" of carrying a nuclear warhead. "For its part, Iran says it never agreed to missile restrictions in the JCPOA and claims its missile tests do not violate Security Council resolutions because they are not designed to carry nuclear warheads. This is absurd," former CIA analyst Fred Fleitz argued in The National Review last year. "Iran's missile program is widely believed to be a delivery system for nuclear warheads. If Iran were telling the truth, it would be the only nation in history without a nuclear-weapons program that nonetheless developed missiles with a range of 2,000 kilometers or more. Iran is not building long-range missiles to carry warheads full of dynamite or to fire monkeys into space." In fact, the Obama administration had argued for keeping in place the stronger prohibitory language of Resolution 1929, but it lost that argument when its negotiating partners wouldn't back the Americans up. "When Mr. Obama sought to include a prohibition on ballistic missiles in the Iran deal, or at least extend a previous Security Council resolution banning them, not just Russia and China but even our European allies in the nuclear negotiations refused," former Obama White House official Philip Gordon explained this week in the New York Times. "They argued that the ballistic missile ban was put in place in 2010 only to pressure Iran to reach a nuclear deal, and they refused to extend it once that deal had been concluded." The question remains, what next? In a short briefing paper on Iran's missile testing, analysts at the Iran Project, a non-governmental group including former diplomats say the challenge for President Trump is to "constrain Iran's missile testing while maintaining the U.S. and Iranian commitment to the JCPOA, the most assured way to prevent Iran from acquiring a nuclear weapon." The Security Council scheduled "urgent consultations" on Iran's missile test earlier this week. Gordon, the former White House official, noted that Iranian presidential elections this spring will likely prompt hardliners to stake out a position of defiance in the missile dispute. The stage would seem to be set for tough rhetoric to escalate, he wrote, including the possibility of terrorist attacks on Americans in the Mideast.